Robert Titus has 149 articles published. We geologists owe a great deal to the highway departments. It is necessary for them to cut great slashes into the hills and mountains so as to allow the passage of roads. And thus it has been that they have, especially since the 1950’s, been providing us with thousands of beautiful exposures of bedrock. Many of these are quite impressive – great, towering cliffs of rock, rising above the passing traffic. They are like magnets to geologists, they lure us to stop and explore. Rte. 209, south of the Saw Kill, displays one of the area’s better exposures. It’s a very impressive cliff of black stratified rock. The beds of rock here are called the Mt. Marion Formation. That’s one of the area’s more important units of rock. It’s a big, thick sequence of sandstone and shales; the beds piled up to a thickness of about 500 feet. Not surprisingly, these are the layers of rock that make up Mt. Marion itself. The sedimentary rocks of the Mt. Marion Formation record a distant moment in the history of this region. 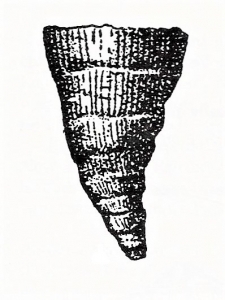 They were deposited as black muds and dark sands at the bottom of the relatively deep ocean that once existed throughout all of eastern New York State. But that was about 380 million years ago. As we said, these exposures are irresistible magnets for all geologists, and we are no exceptions. We drove down Rte. 32 and turned onto the Rte. 209 ramp and took a nice slow drive along the great exposure. It was well worth the effort; our luck was very good. Practically the very first thing that we noticed was a fine specimen of a fossil coral. That was a big surprise, as we had never imagined that this would be a place to search for corals. We usually find fossil corals in limestones. Limestones record ancient shallow, tropical seas, places ideal for corals to grow and flourish. In such locations, corals grow into the great colonies that we know as coral reefs. Each reef is composed of thousands of individuals living together in a single colonial skeleton. But as we looked up at the strata of the Mt. Marion Formation, we could not imagine such an image for this unit of rock. Black shales and sandstones are different from limestones. They accumulated on murky, dark sea floors, places not usually well-suited for corals. But the corals we found here were not the regular run of the mill forms; these ones are known as horn corals. Horn corals are, as the name implies, uncanny duplicates of the horns of cattle. They are widest at the top and taper downwards to a point. The specimens we had collected are probably called by the Latin name Cyathophyllum. They would have been pretty well-adapted to life on the dark, muddy sea floor. We suspect that they grew upwards so that their sharp pointed bottoms stuck into the mud like golf tees. Their wide openings would have projected above the sea floor and they would have avoided being clogged with mud. Corals are predators of sorts; obviously they do not stalk their prey. Instead they are known as “awaiters;” they lay upon the sea floor and wait for some unwary prey to come by. They have tentacles that capture their prey and pull these victims into their gullets for digestion. That’s not a very exciting life, but it works well; corals have been around for about half a billion years and they are likely to be around for another similar length of time. And, so it was, as we drove along the black shales of Rte. 209, that we imagined ourselves at the bottom of an ancient sea. All around us, on a dark muddy bottom, lay numbers of horn corals with their light colored, fleshy tentacles waving back and forth at the surrounding waters, each one grasping greedily in hopes of food. There is certainly a great difference between the world as it is, and the world recorded in the strata. Geologists are generally very good at spatial relations. There must be some lobe in the brain that functions to give us a special edge in that facility. We need it; we are always envisioning the many complex geological structures that we come across. But there is more; there is, after all, a fourth dimension and that’s where geologists are very, very good. Come along and see. Let’s take Rt. 9W down to the malls, just north of Kingston. You might not think this would be an attractive field trip site for a geologist, but you just might be wrong. At the south end of the malls, just across from the Red Lobster, the road forks. We were down there on Black Friday and soon we found ourselves, armed with a camera, risking our lives for you the readers of the Woodstock Times. Black Friday is certainly quite a moment in time. Hoards of avaricious shoppers descend upon all those retail outlets, determined to begin their annual rites of Christmas shopping. The highways are crammed with traffic and that is where we found ourselves. We stood, precariously perched on a supposedly safe set of double orange lines, with traffic streaming by on both sides. Oblivious to our near certain doom we looked south: and into the deep geological past. Just where the highway forks, between the two lanes, is a very fine outcropping. Beyond, and off to the left, was another equally impressive ledge of rock. These were exposures of the Helderberg Limestone, one of the most important units of rock in the area. We said we were looking into the past, and what we saw there was the Helderberg Sea. Back, just a little more than 400 million years ago, during the Devonian time period, this was a very different place. There were no malls and no highways back then. What there was here was ocean. This Helderberg Sea was a very shallow, very tropical sea. Today you would have to visit the Bahamas or west Florida to find something akin to this. But we were not in the Bahamas and we were not even of this time. For us, it was the Devonian and we were gazing across the shining, aqua-colored waters of the Helderberg Sea. Its shallow seafloor was visible from above. We looked down and saw just a few strange shellfish and fronds of algae waving in the active marine currents. The sediment was composed of calcium carbonate, a mineral those plants and animals secreted. That sediment long ago hardened into limestone and that is the rock exposed across from today’s Red Lobster. We were back in the present, and noisy Black Friday traffic streamed by us. We had the presence of mind to shoot a couple of photos. Then we noticed something about the stratification; it was tilted, with the beds of rock inclined to our right. The same was the case with that second outcrop, just a little farther down the road. Then we were swallowed up into the past once again, this time it was to a different past. All around us was total darkness, but we could see, we just don’t know how. We were still in exactly the same place where we started our journey, but there was no highway and, of course, no orange stripes. In the spooky darkness before us we could make out the very same inclined bedding we had just been looking at. But now, each of those strata continued upwards, rising far above us. We had traveled forward through time about a hundred million years. The Helderberg Sea was long gone. It had been buried in a mile-thick accumulation of sediment, mostly sand. Then all those sediments had hardened into rock and the whole sequence had been uplifted and tilted. Above us, for a mile or so, was the bedrock mass of a great mountain range, called the Acadian Mountains. Most of its highest peaks were off to the east in what is now New England. That’s where most of the uplift and folding had occurred, but the deformation in front of us was nothing to sneer at. We were now deep inside a still rising mountain range. It was very much as if we were a mile beneath the surface of today’s Nepal with the high peaks of the Himalayas nearby. Now we noticed the heat and the intense pressure that comes with burial at such depths. There were some occasional groaning sounds; deformation of the rocks was ongoing. All this could do us no harm for, on this journey, we were the mind’s eyes, and little harm can befall the human imagination. But living bodies can be run over by cars. We found ourselves back on the orange stripes of Rt. 9W on that busy Black Friday. We took one more photo and scrambled off the highway, still in one piece. Our journey was a fine exercise in spatial and temporal relations; we had seen the Kingston malls of today and we visited the same sites in moments of their distant past. It’s all the same, kind of. We geologists are good at this sort of thing. Contact the authors at randjtitus@prodigy.net. Join their facebook page “The Catskill Geologist.com. Can you fold a rock? Sometimes we geologists are just as dangerous as bird watchers. Bird watchers are notoriously bad drivers. They will be sailing down the highway when, all of a sudden, some marvelous bird goes flying by. Cross your fingers if you happen to be driving nearby. And, if you are a birder, don’t write us to deny it; we know better! Well, as we said, we geologists can be just as bad. We too, can be sailing down the highway when, all of a sudden, there is some marvelous outcropping of rock: something we never expected to see. Watch out, we are liable to hit the brakes and come to a screeching halt, with you screeching too. Well, you can probably see where we are going on this. 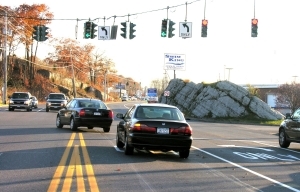 Recently, we were on driving on Tarrytown Road, off Rt. 32, on our way to a lecture up at the Thacher Nature Center. Just after the road makes a sharp right turn, there was an absolutely beautiful folded mass of rock. This was stratified rock and, specifically, limestone. It must stretch a good 50 feet from end to end. And it must rise up ten feet or so. But how can such a thing happen? Go find the strongest man you know and give him a rock and ask him to fold it. There is not a chance that he can do that, not even with a small thin rock. But there it is, a great mass of folded stratified rock. We wonder what professional geologists thought of all this, centuries ago when the science was young. They could not have had any ideas, none at all. It must have been such a mystery. That happens a lot in science, right up to this day. We see a phenomenon and we just can’t explain it. But geology is not a young science; it is a venerable old one. We have been solving our problems for a very long time now and we can explain a lot of them. So, how did these folds occur? The best answer involves the science of plate tectonics. That was the great revolution in geological thought that occurred in the middle 20th Century. We now know that continents and subcontinents can move across the surface of the Earth. North America is sliding west, right now and beneath your feet. It’s very slow so you can never feel the motion, but it is happening. Starting during the Devonian time period, about 400 million years ago, a landmass named Avalonia was moving westward across an early version of the Atlantic Ocean, sometimes called the Proto-Atlantic. Avalonia eventually collided with North America and that generated a lot of pressure. The stratified rocks of North America came to be squeezed. You can simulate this with a large paperback book. Hold it in your two hands and press. The book will fold, quite likely into an anticline. One hand is North America while the other is Avalonia. It’s a nice easy lab experiment; you are doing science. Well, that is was happened to the strata along the highway. But our problems are not all solved. We didn’t hit the brakes because we had seen a fold. We hit the brakes because of which rocks were folded. You see, the problem is that there are no other folded rocks in this vicinity. There are lots of outcrops of the Helderberg Limestone all around, but none of them are folded. These strata lie just a little too far to the west to have been folded by the effects of a colliding Avalonia. You can go see this for yourself. Just wander the highways around there and see what you can find. The answer is nothing but flat lying rocks. We must say that we are flummoxed by all this. How could it be? A lovely anticlinal fold just seems to rise up out of the ground without a proper explanation. We may be flummoxed, but not bothered all that much. In truth, it is nice to still have mysteries. We don’t envy geologists or other scientists of the future. They will have so many fewer problems and mysteries to go out and solve. Or will they? That’s debatable. But we do have problems. We are blessed with lots of them. Rockcraft 101 – the Shaved Rock – We occasionally write about a mythical field we call “rockcraft.” There’s really no such thing or the Boy Scouts would have a merit badge and a handbook about it. But if there were a field of rockcraft it could keep an outdoorsman quite busy. Rockcraft would be the use of signs found in rocks to guide you in the woods. Believe us, glaciers would be responsible for a great deal of rockcraft. Think about what a major glaciation amounts to. In this vicinity, for example, at about 20,000 years ago, there was a sheet of ice about a half mile thick. Imagine the weight of all the ice. Not only is the pressure of that weight bearing down upon the underlying countryside, but there is the frictional drag which comes with the southward movement of the ice sheet. That’s a lot of stress. It gets worse. The bottom of a glacier is, to say the least, dirty. There is a great deal of silt and sand down there. Also, there are likely to be many cobbles and boulders being dragged along. And all of this material is pressed onto the underlying countryside. It’s no surprise to find out that a passing glacier leaves a lot of evidence behind. There are a lot of glacial phenomena that we like to watch for. One of them doesn’t even have an official scientific name that we have even seen. So, we just call it “shaved off rocks.” This is what happened. Here in the Catskills there are a large number of sedimentary rocks that are rich in small and large cobbles. The rest of the rock is usually a sandstone, so imagine cobbles floating in a matrix of sandstone. When a glaciation occurs, it is normal for a bedrock to become ground down by the sand and silt in the passing ice. The behavior is exactly like what you get with sandpaper, only this process is much more effective; it can grind away inches of solid rock. When a glacier is grinding away at a sandstone it is eventually liable to encounter some of those cobbles we mentioned. These may become popped out by the moving ice, but they are more likely to be held in place as they are well cemented into the rock. That means that the grinding process will begin to bevel right through the cobbles and shave off their tops. 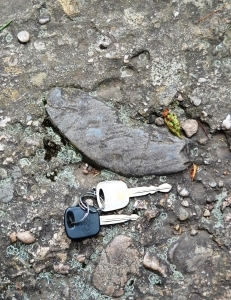 What’s left behind is half a cobble with the top planed off to a flat surface. 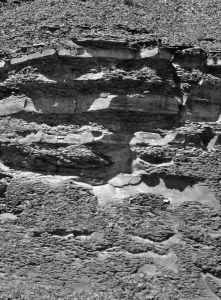 That leaves a very distinctive rock outcropping, a sandstone surface with the beveled off cross sections of cobbles upon it. A good place to go and look at such rocks is along the escarpment trail, right at the edge of the Catskill Front. Your best chances of seeing these are at North Lake State Park, just north and south of the lake itself. We have seen some very nice beveled off rocks immediately south of Boulder Rock and also up on Newman’s Ledge (Park maps will guide you to these sites). If you find either of these locations try to imagine the thick sheet of ice that was once here. Then remember that the ice filled up the entire Hudson Valley below. If there is anything bad about these shaved rocks, it’s that usually you cannot tell which way the ice was moving. That’s not always the case. When the ice was relatively thin, it did not press down as much. Under those circumstances a solid quartz cobble might put up enough fight to resist the beveling at least to a certain extend. That’s when you get something called a “rat’s tail.” A vee-shaped cone of sandstone lays on the protected downstream side behind the cobble and is sculpted by the passing ice. The protected cone points in the direction of flow. We found one of those on the point of rock between North and South Lakes. Our field of rockcraft is rarely about very important phenomena. It’s, instead, a field devoted to recognizing interesting things in the rocks. Shaved rocks are not terrible important, except as testimonies to the erosive power of a glacier. That’s good enough. Before I was lured away by the fame and fortune of writing geology columns, I was a professional paleontologist. I published many an article on the ancient life of New York State in professional journals. I speak of this because my science is and has been under assault. The centerpiece of paleontology, like all biology itself, is the great theory of evolution. All of my professional research was founded upon evolutionary theory and the best studies that I ever did myself were documentations of evolutionary events. I have, three times, followed a fossil species through sequences of stratified rock and watched as it evolved into a second species. I have not only seen species evolve but I have followed them as they evolved into new ecologies. These studies were among the greatest privileges that ever came with my being a scientist. I have seen evolution about as well as anyone, anywhere. That’s not bragging; it’s just the record. Paleontology is the exploration of life’s distant past. It is nearly heartbreaking that some religious groups oppose my science’s very foundation. Science is not about religion; we steer well clear of the supernatural; ours is the study of the natural world only. We neither oppose, nor support any religion. Some of us practice religions; others, like me, do not. But we do teach our sciences. Ours is a scientific and technologically advanced society in a competitive world, and it must maintain the highest standards in the teaching of science. There is no place for, say, economics or politics to play a role in classroom science. Likewise, this is no place for any religion to intrude its views. Such notions should be dismissed immediately. Economists and political scientists generally don’t interfere with the teaching of science, but there are members of the religious community would if they could. Young Earth “Creation Science” and its fraternal twin “Intelligent Design” profess that a great supernatural entity (God) created the world and all life on it. Well, fine, many scientists are religious and believe the very same thing. Where science and these particular religious views part company is over the issue of evolution. Was the Earth and life on it created as we see them today, or did they form and then change naturally? Did life change slowly through time, evolving from a simple ancestral form into what it is today? In recent years serious efforts have been made in Pennsylvania and Kansas to inject Intelligent Design into high school biology programs. I hate to think of the position that many dedicated biology teachers might find themselves in. Should they risk their careers in defiance of religion? Or should they knuckle under? It is a dreadful dilemma. 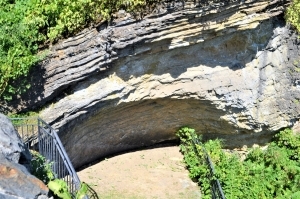 This column has found a very considerable body of evidence that, like the rest of the planet Earth, our Hudson Valley has a very venerable geological history. We have, over the last few years, taken many trips into our region’s distant past. We have visited the great deep oceanic abyss that once covered all of Columbia County. Its dark oozy mud is now hardened into the black Normanskill Shale which makes up much of the land along the Hudson. We have also visited the shallow tropical sea that once existed here. Its Helderberg limestones make up all of Becraft Mountain and they are rich in an exotic array of fossils. All those fossil species are now extinct; they were denizens of distant past. At Bash Bish Falls we have watched as great mountains rose to enormous altitudes in what would eventually be the Appalachian realm. Then we saw those mountains slowly weather away. We’ve seen glaciers advance down the Hudson Valley and, after they melted away, we saw Glacial Lake Albany fill most of our valley with icy meltwater. Altogether these historic events took enormous lengths of time: hundreds of millions of years. If either Creationism or Intelligent Design is true, then all of this geological history is horribly misconstrued at best, fraudulent at worst. I and all of my colleagues are seriously deluded people. Can that be? I have always tried to tell where you can go and see the evidence for yourself. I hope that many of you have done some of the many field trips that I have described. If so, you can judge for yourself. Our valley and our Earth are very old. If Creationism or Intelligent Design is true, then science itself is a hoax. Well, keep reading my columns and judge for yourself. Reach the author at titusr@hartwick.edu. The Hudson Valley: 400 years? Or 400 million? This year (2009) marks the 400th anniversary of Henry Hudson’s voyage up the Hudson River. This is a real landmark and there will be a large number of events commemorating Hudson’s historic journey, as well there should. We wonder what role geologists can play in all this? We have a way of turning up our noses at mere centuries, you know. Even a few million years is not all that impressive to us. But, in fact, when it comes to cultural history, geologists have pretty much the same sense of time and antiquity as everyone else. We will be participating in at least one commemorative event in September. We will be speaking at the village of Stuyvesant, presenting a talk on the town’s geological history. We will also be writing up an ice age history for the town of Claverack. But today, we would like to survey the geological history of the whole Hudson Valley. It has a venerable past and, of course, it dates back a lot more than 400 years. In fact, it appears to date back about 400 million years. Now We had better issue a few caveats first. The history of any ancient river is always hidden in the mists of time. It is hard, really hard, to document the distant past of any river. You see, they do not preserve records of their earliest times. All rivers are in the business of eroding the landscape they flow across. That erosion destroys all evidences of their pasts. The earliest stages of development of a river’s history are worn away by the latter. We geologists have to summon up all of our powers of deduction to intuit the missing history. So, the story we will relate today does not carry the certainty of other geological tales. The evidence is just not there. Late at night, in geology bars, we happily debate this sort of thing. As we said, this story, or this version of the story, begins roughly 400 million years ago. At that time New England was recovering from a great mountain building event: the Taconic Orogeny. Massive crustal uplift had created the earliest Taconic Mountains which, originally, towered over western New England and parts of New York State. But by 400 million years ago these mountains had, in fact, experienced a great deal of erosion and they were mere shadows of their former selves. But soon there would be another major mountain building event: the Acadian Orogeny. An even taller range of mountains came to rise above pretty much the same landscapes. Today all these mountains have largely eroded away. We still have remnants of the Taconic’s, and the Berkshires hearken back to the much taller Acadians. The point of all this, is that the existence of these mountains would form an eastern barrier to any potential flow of rivers. If you look around eastern New York State, and all of Connecticut, Massachusetts and Vermont you will not see any significant west-to-east flowing streams. No such streams have existed for at least 400 million years. Erosion of these long-ago Acadian Mountains produced vast quantities of quartz sand that eventually hardened into the bedrock of today’s Catskill Mountains. 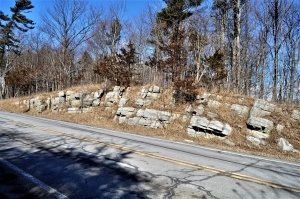 Originally, these sedimentary rocks piled up right against the Taconic’s and there was, at first, no room for an early Hudson Valley. These sandstones were very rugged stuff and they formed a barrier to any streamflow. Thus, there are no east-to-west flowing streams passing into and then beyond the Catskills. But rivers, large and small, must have descended down the western slopes of the Taconic’s and when they approached the Catskills they had a problem. Which way would they flow? They couldn’t return back uphill to the east and they couldn’t advance into the Catskills either. That left north or south; they turned south and flowed toward the Atlantic. That first such flow marked the origin of the ancestral Hudson River. It assumed much of its current path, flowing north to south and on into the Atlantic. There was more to come. During the late Jurassic, about 150 million years or so, the crust of the lower Hudson Valley rose, forcing the Hudson to carve a canyon through what are today the Hudson Highlands. With that, much that we recognize, today, as the Hudson Valley came into existence. Is this the true story? We don’t know; it is a good one, but much debate remains. Maybe someday we will have a better version. But, until then, this yarn has a lot to recommend it. The next time you find yourself out in the middle of the Hudson Valley, look east to the Taconic’s, and then west to the Catskills. At first there had just been a small crease here, lying between the two highlands. Appreciate that for hundreds of millions of years the Hudson has been slowly widening and deepening this crease, turning it into our great Hudson Valley. Mt. Moreno might be considered a nondescript little hill in southwestern Columbia County, it is just not all that noticeable a landscape feature. There is one road that curls around it and you have to know where that is, or you will miss it altogether. There are some very nice views of the Hudson River on this hill but not much else to attract people. But we are not “people,” we are geologists. If you drive on Mt. Moreno Road along the western fringe of Mt. Moreno, you will notice some pretty nice outcrops here and there. Continue south on Rte. 9G and you will see more. There are stories in these stones and good ones too. It turns out that Mt. 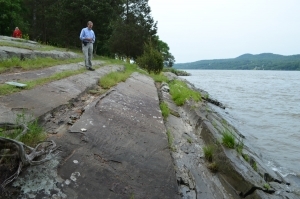 Moreno is very well known to New York State’s geological community. It is the site of one of the greatest “infestations” in our region’s history. If you do drive past Mt. Moreno, you might decide to pull over and take a look. The rocks are stratified, and they are largely dark, almost black sandstones and shales. This is the Normanskill Formation. But there is more; there are horizons of chert here too. Chert is better known by the word “flint.” Flint is a shiny dark rock which was used by Indians and other stone-age cultures to fashion into stone implements. You have, no doubt, seen some very fine arrowheads and can appreciate the skill that went into making them. Flint is an extremely fine-grained rock and that’s why it breaks into small curved chips. An experienced craftsman could pound away at the rock and shape it pretty much any way he wanted, and that includes points, hammers, scrapers and axes. But just saying that the rock is fine grained does not do it justice; there must be much more. That’s where we get to our infestation. Long ago, in fact about 450 million years “long ago,” our Hudson Valley region lay at the bottom of a very deep marine trench. Do you live in the Hudson Valley? It is hard to believe, but right where you are now was probably 20,000 feet, or more, deep, lying at the bottom of the ocean. Take a look out of your window and see the bottom of the Marianas Trench. Imagine very cold temperatures, strange fish and unbelievable high pressures. But mostly imagine it as not being dark as much as completely black. That’s right here, long ago. The time is called, by geologists, the Ordovician. This marine deep was called the Normanskill basin and it is a very important part of our geological heritage. A land mass, as large as the islands of Japan, was colliding with North America and the crumpling, associated with this collision, helped make the deep basin. There were no fish, but in every other respect, this was a Marianas like trench. There were volcanoes and probably many of them. Volcanic eruptions produce silica-rich soot, which can rain down on the seas. There waters would thus be very well supplied with silica (SiO2). That is not especially good for most organisms, but it is very good for radiolarians. 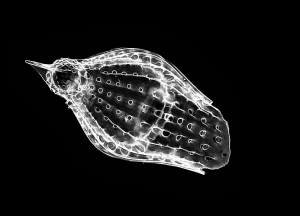 If you have never heard of radiolarians, then you are not alone. They are a group of microbes that are mostly unknown to the general public. You might call them protozoa as they are single celled creatures with animal affinities. They are still alive today and they have tiny skeletons composed of silica. Silica can be hard to find in sea water, it is not very soluble. But after a sizable eruption, the silica content could sky rocket. Those were the good times for our microbes; they had what they needed to make more of themselves. Volcanic eruptions may very well have been followed by enormous population blooms as astronomical numbers of radiolarians appeared. None of them lived very long and soon, large amounts of silica skeletons were falling to the bottom of our Normanskill Trench. Thick deposits of them piled up in ever thickening accumulations. Radiolarians might have been very small, but hundreds of feet of radiolarian sediments were piling up. Burial is nearly forever; these deposits have spent almost the entire last half billion years at Mt. Moreno. They have been deeply buried, under an enormous weight of rock for all of that time. What would you look like after a couple of hundred million years of crushing weight? Well, our radiolarians gradually saw that pressure crush them and harden them into that rock we call flint. So, now you know a lot more about Mt. Moreno than ever before. Do take a look at those shiny flint deposits along the highway. These rocks had a “previous life” as microbes in a very dark cold ocean. Contrary to the stereotypes, most scientists have rich imaginations and we often like to indulge in wild speculations about our fields of research. Most of the time these ideas can be quickly proven wrong, but sometimes we get an off-the-wall idea that is not so easily eliminated, in fact it may start to look pretty good. 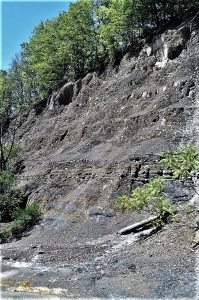 Recently an interesting new hypothesis has been introduced that may offer us a chance to better understand the black shales and dark sandstones of the Catskill sequence. The dark appearance of these strata makes them remarkably eye-catching and they loom, dark and menacing, over the landscapes wherever they are exposed. The best local area is along Rt. 209, just south of the Saw Kill. Black stratified rocks are often rich in undecayed organic matter; it’s the black of the carbon gives these rocks their color. This generally suggests to the geologist that there were low-oxygen conditions in the sea waters at the time of deposition. Without oxygen, most decay bacteria cannot function, and they soon die. But why low oxygen? That’s where that new hypothesis comes in. That new idea is sometimes called the “killer tree hypothesis.” Although the term may seem a little too extravagant, it probably isn’t that far off the mark. The story starts during the middle Devonian when the evolution of land plants was really starting to accelerate. 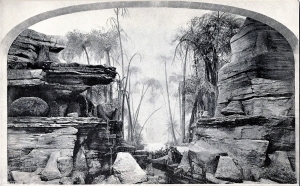 By then land plants had been around for quite some time, but they had only managed to evolve into small forms with thin, weak stems. Nothing that could be called a tree had yet appeared. Trees require wood as support tissue. Not surprisingly, when wood did evolve, large, tall land plants soon followed, and the world’s first forests quickly appeared. So, what do trees on land have to do with black colored shales in the ocean? Quite a bit, it turns out. Wood had much to do with our story because it allowed trees to grow so tall that they required deep root systems and that’s when we return to the black shale and the poison sea. Complex root systems help to break up bedrock and they greatly accelerate the rate at which bedrock is weathered into soils. 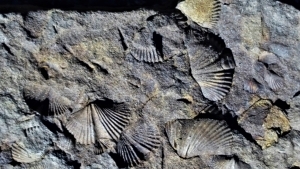 Not surprisingly, deep, well developed soils appeared in the Devonian, possibly for first time in history. This was a major transformation of the landscape. Barren landscapes with thin soils were soon replaced by lush foliage and thick soils as our world’s landscapes turned green and blossomed with plants that grew in deep soils. All of this led to far more rapid rates of deposition in nearby oceans. Thick soils were easily eroded and provided sediments that glutted nearby streams. The sediments were eventually transported into the nearest ocean which was the Catskill Sea. All of this material was rich in dissolved nutrients, materials such as nitrates and phosphates. When these nutrient rich sediments entered the Catskill Sea, they fertilized the water and that led to the next step in what was now a complex chain of events. The newly fertilized oceans were ideal for algae; they experienced what is called “algal blooms.” Great population explosions of algae occurred in the shallow, surface waters of the Catskill Sea. While all this was great for the algae it was tragic for just about every other category of marine organisms. As the algae died, they were attacked by decay bacteria. The decay process consumed so much oxygen that the seas soon became oxygen-depleted. With the loss of oxygen, bacteria had in effect poisoned their own habitat. Because they needed oxygen too, their numbers soon plummeted and very soon, all types of animals suffocated in the oxygen depleted sea as well. But the algae just kept on proliferating in the surface waters where there was plenty of oxygen, diffusing in from the air. Soon, large masses of undecayed algal material sank to the floor of the ocean. Almost none of this biological matter ever decayed, consequently the sediments that are found there are very rich in black organic carbon. These would eventually harden into thinly laminated, black shales. When this happens today in a closed body of water, we refer to it as eutrophication. 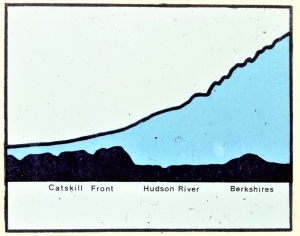 The Catskill Sea was largely isolated from other deep bodies of water. All these conditions promoted what are called thermally-stratified and stagnant waters. The surface layer was hot while, at depths, the lower strata of water remained cool. Dense mats of floating plants and animals grew upon the warm surface waters. Depth stratification and dense planktonic mats prevented agitation and mixing of the waters, causing stagnant sea floor conditions to develop. Soon a deep basin with a black mud bottom, devoid of life, appeared. Virtually nothing could live in this sea, except at the surface where there was always plenty of oxygen. The sinking of the Titanic is one of the great stories of history. It’s complete with drama, heroism, and even suspense, despite the inevitable ending. Throw in a little romance and no wonder that the current movie has been such a hit. Part of the movie’s success is the allure of the deep. The ocean’s great mysterious abyssal plain retains, even today, a compelling fascination. To scientists, however, equally gripping was the story of the discovery of the sunken liner. You remember it. Intrepid oceanographers, from Woods Hole, Massachusetts, descended to the depths of the ocean’s great abyss in tiny submarines. Powerful headlights shined upon the long unseen sea floor and then upon the wreckage itself. What an incredible moment! The substance of fiction became history. The depths of the seas had long been shrouded in mystery, and to see actual film from the deep is one of the great achievements of our century, certainly ranking with anything that our space programs have achieved. Much of the abyss is monotonous mud, but there are those many shipwrecks, and a whole exotic ecology of truly wondrous and intriguing animals. All of this imagery is made even more appealing by the seeming impossibility of traveling to the bottom of the deep sea. Few of us, after all, get invitations from Woods Hole. If you could visit the great abyss, would you leap at the chance, or would you shrink from the real danger of the journey? Would a good movie be enough, or would you have the adventurous streak needed for that perilous trek to the very bottom of the sea? It is dangerous; people have died down there. Let’s make it easy. We can have you onto the abyss in about half an hour and it will be no more dangerous than a short car ride. Take the Glasco Turnpike east from Woodstock until you approach Mt. Marion. Look for John Carle Road and turn right and head south along it. The path of the road is like that of a sinking ocean liner. First it strays only just a little from its straight path. Then, as if filling up with water, it veers sharply to the left and rapidly descends a steep slope. Near the bottom it lurches sharply to the right and settles, once more, onto a flat floor. And indeed, like a sinking ship, the road has arrived at the bottom of a sea. There is nothing figurative in our remarkable claim; this is really the bottom of a sea. Or it was. Rising to the right of the road is a cliff of dark black sandstones and shales. These accumulated at the bottom of a deep sea, one that was here nearly 400 million years ago. It can be called the Catskill Sea and the layers of rock you see here were once the muds that made up its bottom. It’s a curious thing, but way back then, the Devonian time period, most of New England was rising into a substantial mountain range. These, the Acadian Mountains, would reach heights of maybe 15,000 feet – perhaps even more! As they were rising, however, the crust of the adjacent vicinities, including today’s Hudson Valley, became depressed. Given time, a fairly substantial deep sea was produced. How deep? we don’t know, but it would have reminded you of the depths of the North Atlantic, a still, mud-bottomed, dark and very silent sea floor. Much of the roadside exposure is thinly bedded, black shale. That was the mud. Those layers piled up slowly over uncounted centuries. Each thin horizon was once the sea floor. With time another and then another thin seam of mud would accumulate. As the weight piled up the mud was squeezed and hardened into shale. The dark sandstones are somewhat different. These were more active influxes of sediment, moments when masses of sand tumbled into the depths. There were living creatures at the bottom of this sea. It only took us a short time to find fossil shellfish here, small animals that spent their whole lives on this quiet sea bottom. No crashing ocean liners interrupted their lives. Scientists did come and visit them, but not until nearly 400 million years after their deaths.